Old Jules Research Papers explore a book written by Mari Sandoz about a frontiersman who wants to begin a new life in the great lands of the new west. The book “Old Jules” by Mari Sandoz was written as a tribute to her father, the story of a frontiersman with a dream to begin a new life among the great lands of the relatively undiscovered lands of the new west. It is a tale of strength and courage as Jules creates a home in western Nebraska under the Homestead Act of 1863. 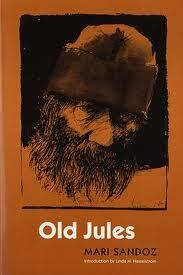 He overcomes many hardships as well as the torment of longing for the elements of his old life that brought comfort. Jules however, succeeds in his determination to build something new in this land that has so much to offer. “Old Jules” begins with Jules Ami Sandoz joining the many settlers moving west to claim land under the Homestead Act of 1863. Originally from Zurich, Jules left his family and sweetheart, Rosalie, as well as his schooling to become a doctor behind to forge a new and exciting life in America. It was the beginning of the 1880s and he was confident that as soon as he got settled Rosalie would join him in this adventure that held so much promise. However this was not to be. Jules settled in Northeastern Nebraska, Knox County. Jules wrote continuously for Rosalie to join him. Rosalie failed to join Jules and after three years of waiting, Jules marriage is to the first woman who showed interest, Estelle. Unfortunately she did fulfill Jules’ needs or share his enthusiasm of his intended life. Jules decided to pick up his belongings and leave Estelle for land farther west. The father west the more primitive and remote civilization became. These hurdles did not deter Jules and he became a homeseeker like thousands of others heading west. Jules decides to settle in an area called Mirage Flats. It is here that he diligently works at marking his piece of land and building a homestead with land to farm. Mirage Flats is not too inhabited at this point and settlers straggle along the trail west while some settle on this area along with Jules. Those wishing to farm the land like Jules were in constant conflict with those wishing to raise cattle. This became a source of discontent along the frontier. At this point in his plan, Jules’ life consisted of building his homestead, digging his well, tilling his land, and traveling into the town of Valentine for supplies. Industrialism - Industrialism research papers write about the major shift in the Nineteenth Century from Agrarian to Industrial society. Paper Masters writes custom research papers on Old Jules and explore a book written by Mari Sandoz about a frontiersman who wants to begin a new life in the great lands of the new west.